A Conservative Republican former Texas Supreme Court Justice, who ran against a Republican opponent backed by Gov. Rick Perry, is considering a challenge to the tremendously flawed Primary Elections held in the state two weeks ago on new Electronic Voting Machines. While electronic voting systems hold promise for a more accurate and efficient election process, numerous entities have raised concerns about their security and reliability, citing instances of weak security controls, system design flaws, inadequate system version control, inadequate security testing, incorrect system configuration, poor security management, and vague or incomplete voting system standards, among other issues. For example, studies found (1) some electronic voting systems did not encrypt cast ballots or system audit logs, and it was possible to alter both without being detected; (2) it was possible to alter the files that define how a ballot looks and works so that the votes for one candidate could be recorded for a different candidate; and (3) vendors installed uncertified versions of voting system software at the local level. It is important to note that many of the reported concerns were drawn from specific system makes and models or from a specific jurisdictions election, and that there is a lack of consensus among election officials and other experts on the pervasiveness of the concerns. Nevertheless, some of these concerns were reported to have caused local problems in federal elections resulting in the loss or miscount of votes and therefore merit attention. Madog Pavanelli & the Virtual Country Boys new song, "In Ohio"
Ohio's Presidential Election was a fraud in 2000 and 2004. Care to go for three? They can. They control the elections. That'll be three times Ohio handed over the country. What about the current insane financial devastation? With that, George Bush can cross the last task off his "to screwup" list. Congress and the major candidates don't even want to get it. Wall street most surely gets it - and keeps on getting it. Meanwhile people are losing their homes, jobs and savings. We need to hold them all accountable and stop all this. In Ohio, the poster child for stolen elections... does Main Street really care?? Copy and distribute freely - in 3 formats - bluegrass, big band, and 12-string solo. 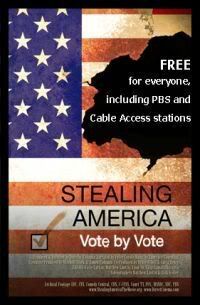 "STEALING AMERICA: Vote by Vote does for American democracy what An Inconvenient Truth did for global warming." Why is this film a "must see"? Inaccurate vote counts, illegal purging, improbable machine errors, and more have led millions of people to believe that recent national elections were stolen.